As I see it, it’s all about the style of the photo… I remember years ago, I fed-x’ed my portfolio off to the Art Buyer for Bon Apatite Magazine, just to see what would happen. Who knows, maybe I could become famous or something… :o) It didn’t take long for the package to return with a nice polite letter that said something like “This is really nice food photography, but it’s not the kind we use.” Not the “kind”? What the heck did that mean? So I did a little studying of the magazine and I think I figured it out. I’m an advertising food photographer at heart. That’s just my natural tendency. I like to light the food so that I can get the maximum texture, and to make the food as textural and appetizing as possible. Like I mentioned, that’s my opinion and I’m sure others will disagree. 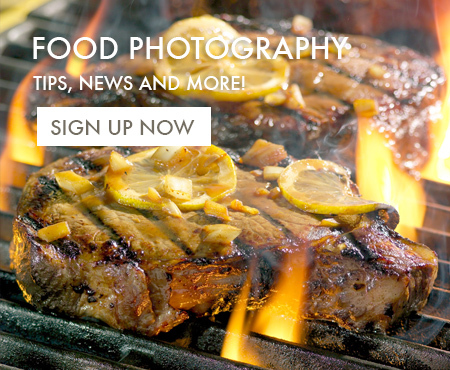 I prefer to light the food and show as much detail as possible, and I’ve come to the conclusion that editorial food photographers have other preferences. They are more concerned about the overall look of the photo, whereas I’m more concerned about the individual item of food in front of my camera. To me, the set is secondary. So, in a nutshell, I believe that advertising food photographers are more interested in detail of the food and showing it off in it’s best possible light. Editorial food photographers are more interested in making pretty pictures of food, where sometimes the food looks as though it is a prop in the photo instead of the reason for the photo. I’d be curious to know what YOU think about this subject, so please leave a comment below and if you join my mailing list, I’ll send you more info from time to time. I’ve set up in front of a window and tried some editorial style images but found the project less challenging than my usual style. The project became more about the food and the props rather than the food and the light. It’s not that I didn’t know how to shoot in that style, it is just that it didn’t excite me as much. It didn’t have the right mindset. If I had to do it I could…I just don’t want to. On the other hand, some editorial shooters may not have the equipment and technical know how to use artificial light, the appropriate cameras and lenses to be able to get close enough and sharp enough to the subject, and the post production skills needed to make an art director happy. Thanks again for a great topic. I’m an editorial photographer and love following your blog for different perspective and knowledge you share.I agree with a lot of what you said here because while a bit of my work has been used for advertising, I personally find doing a commercial advertisement a lot more challenging. But, that’s because I didn’t get in this business the same way you perhaps you did or Jerry did. We food bloggers turned photographers were at some point just filling the gap between meeting our audience through visual imagery. Which, in essence requires story telling and thus editorial photography. Some of us wanted to change this hobby into profession and we end up here. My point is, the professional editorial food photographers who’s work I follow, all if not most of them are equally good with advertising and most of them use a lot of artificial lighting and setting to create those fabulous images for magazines. They light their food and scene differently and it’s far more complicated. I know because it was a lot easier creating food for my blog, same setup, playing around props versus work where the quality and direction can be entirely different. A great read and agree with what Kulsum says. I ended up ‘trying’ to be a food photographer because I turned a food blogger, the progression was natural and lucrative as a career. I also accept that I shoot in the same light, same camera, same angle most times as it is convenient. I don’t have the technical know-how and experience to handle different lights or detailing at this point but given time and opportunity I would not shy away from reaching out and exploring new ways. I am glad I read your post and it brings home the point, as food blogger turned photographer my skills need far more sharpening before I call myself a food photographer. Very interesting conversation. I was recently given a large stack of Bon Appetit ranging in date from 2007-2011 and a couple of Food Network Magazines.. As a photographer with an interest in food I went through the stack looking at the publishers techniques. There was a sharp line between 2007 and 2008 for Bon Appetit! Before 2008 they did a fairly good/not great job of lighting their food and after that it seemed like they used one light and little if any fill light. Some of the shots were a little hard to look at. I admit that my perspective was a bit skewed by the fact that I know how a fill light is used. The Food Network didn’t seem to make any change. They must have had a management change of mind at some point in 2007, maybe a cost saving thing? My point is that your conversation is between editorial and advertising. But the magazine is an ADVERTISING tool. They are selling products and a life style that uses these Kitchen Aids, Cuisinarts. and other tools, and the life style of the affluent. So they are also in the advertising business. Not that the change of it self really affected their circulation. I can’t speak to that. I think that having and looking trough the magazines would be very interesting. I don’t think tough, that the magazines do sell anything, except more magazines. It’s up to each advertiser to sell Kitchen aids and such. Magazines are there to promote the concept of cooking, and do that through the editorial content, and I guess that means making pretty pictures. Thanks for offering your viewpoint on this. I hadn’t though about it quite that way but I feel you may have hit the nail on the head. With regards to which style is easier to photograph, I’m not so sure. My instinct is the same as yours – I like to go in close and focus on detail and I think that reflects my background (as a chef) too. I also think there is a world of difference shooting for a blog where you have complete control of lighting, composition etc and photographing on location. A recent job saw me photographing pizza for a food manufacturer in the corner of an office – not ideal, but it turned out well! Incidentally I have three revenue streams – Consulting (recipe development for food manufacturers in the UK), teaching (cookery, I’m a registered visiting lecturer and teach regularly at a local college) and photography, not just food, but food / hospitality related. I’m currently studying for a BA (hons) photography and this is having a profound effect on my photography – as you can imagine. I’m sharing this with you because I like your blog and the way you present information and I sense I’ll find your site increasingly useful! I’m glad you’re getting something out of this and I hope it helps you to make prettier pictures. Did you join the email list? Yes, I did and I’m following you on LinkedIn too. I think you hit the proverbial “nail on the head”, Michael, regarding the differences and reasons why. I might add that, in addition to natural lighting being easier (and less expensive) for the non-technical photographer, there are some other factors contributing to the differences. Many magazines don’t pay for photos at the rates they did in the past. Also, lighting is more complicated in typical interiors while the lighting industry goes through changes with varying color casts. Ambient is just an easier, less costly and less technically proficient solution. However, the outcome is that the food seldom looks mouth-watering, delicious or truly beautiful. Btw, what do you consider recipe books, advertising or editorial? Those are great points, Amy! However, I’m not sure if using natural light is easier, because the photographer has to work quicker in order to get the shots he/she needs. Because the position of the sun is constantly changing, this means that the photographer has to chase light and work quicker to get the shot. With flash or strobes, the photographer has complete control over their lighting and doesn’t have to chase light like he/she would if they were using natural light.